Browsing articles tagged with " dog safety"
The first frost was on the old pumpkin the other day when I took the dogs for their morning constitutional. So it struck me that it might be a good time to suggest things we can do to care for our pets when the weather outside gets frightful. 1. Don’t leave pets outside when the temperature plummets. 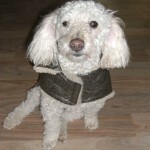 Just because your dog wears a fur coat, doesn’t mean he’s impervious to the cold! And I’m not just talking about house pets. If you have a dog that generally lives outdoors, make sure there’s adequate shelter. It should be dry and draft-free with plenty of clean bedding* and preferably with the ability to safely heat it. *Be wary of using blankets for bedding. Fido might play in the snow then lay on his blanket and a wet blanket can freeze, leaving Fido with no warmth. Better to use straw or hay as it allows moisture to evaporate, retains heat and is biodegradable. You can buy it from farm stores; just make sure it smells fresh and sweet, like new-mown grass. 2. Get the right pooch for the climate. Of course, this isn’t always an option but if you’re now in the process of choosing a pet then it’s something to bear in mind; it’s pretty obvious that a husky will fare better in the cold than a hairless Chinese Crested. Bear in mind, too, that animals need time to adapt to temperature changes, just as people do. A St Bernard coming from the tropical climes of south Florida isn’t going to be as resilient to frigid cold in Alaska as a native hound will be. Normally I don’t encourage dressing-up of pets; I’m more of the “au naturel” way of thinking. 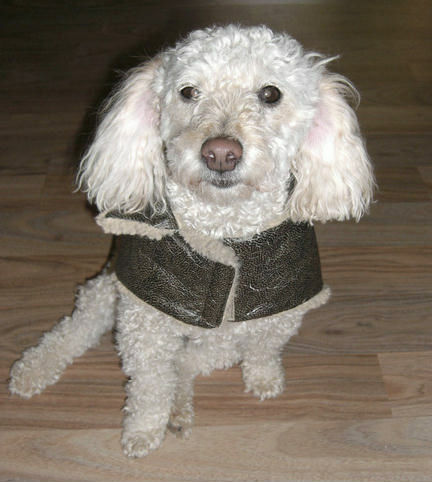 However, extreme weather calls for appropriate measures and, as you can see from the picture of my pup, Vinny, sometimes a cozy jacket is called for. Salt and other chemicals that are used to thaw roads and walkways can cause pads to crack and be sore. And, if ingested, these chemicals can be downright dangerous. Boots are one way to solve the problem but most dogs don’t like to wear them. Instead, be vigilant about washing your pup’s paws before he has a chance to lick them. And to prevent ice build-up on paws, rub a little baby oil on and between the pads before going outside. The pads will stay more pliable and resist the formation of ice. You should also keep the hair between Fido’s toes well-clipped and be sure his nails are short so that snow can’t cling and form ice balls, which can be quite painful. Pets who spend a lot of time outside in the cold will burn up calories to keep warm, so a little extra in the old feedbag is well-advised. However, Lassie may be spending a lot more time at home in front of the fire these days, or Rover’s walks may be shorter than in the balmier months. In that case, be careful you don’t overfeed. As for water, dry winter weather leaves dogs more vulnerable to dehydration so fresh water is essential at all times. To help prevent outside water from freezing use a heavy plastic dish as this loses heat more slowly than metal. A deeper dish will freeze less easily; and keep the dish away from shaded areas or, better yet, get a bird bath de-icer. Most importantly, check the water often. I already touched on this with regard to bedding but if Bowser or Lucy get wet, it’s also a good idea to give them a thorough rub-down before they settle inside. A wet pet will chill rapidly, just like you. There’s always a possibility a dog may crawl under your car while the engine is still warm. (Cats and other little critters have a nasty habit of crawling into your car’s engine). Before starting your car you can honk your horn or bang on the hood to scare any animals away. Frostbite is tissue damage, usually to the extremities, caused by exposure to cold. If it’s cold enough and exposure is long enough, the tissue can actually die. In animals it’s not the easiest thing to spot because of hair coverage, but check the ears, paws, tail and scrotum in particular to see if the skin is pale and they are very cold to the touch. Treat frostbite by carefully warming the affected areas. Do not rub or massage the frostbitten tissue; you risk causing infection that way. Instead, use warm cloths, heat pads or heat lamps. Then get your dog to the vet pronto! As the tissue warms it can be very painful and will need to be monitored and your vet will likely prescribe painkillers. Severely damaged tissue may require amputation to avoid life-threatening conditions such as gangrene. This is a lowering of the core body temperature. Shivering is the first sign of hypothermia and, if heat loss continues, respiratory distress, paralysis and cardiac arrest can follow. Treatment involves rapid warming of the body. For mild cases keep a pet heating pad on hand, or hot water bottles, heat lamps, hair dryers and blankets. A warm bath can also do the trick but always follow-up with a visit to the doctor to check for any lingering problems. Severe hypothermia requires immediate veterinarian intervention. It’s an old adage but oh so true. A healthy pet is the first and best defense against winter cold and any ailments it may bring. The young and the old, of course, are always at greater risk so be watchful and be prepared and, please, keep a more vigilant eye out for strays at this time. Try and get them to a safe place, or at least put some food out and set up a shelter so they have a chance to survive.